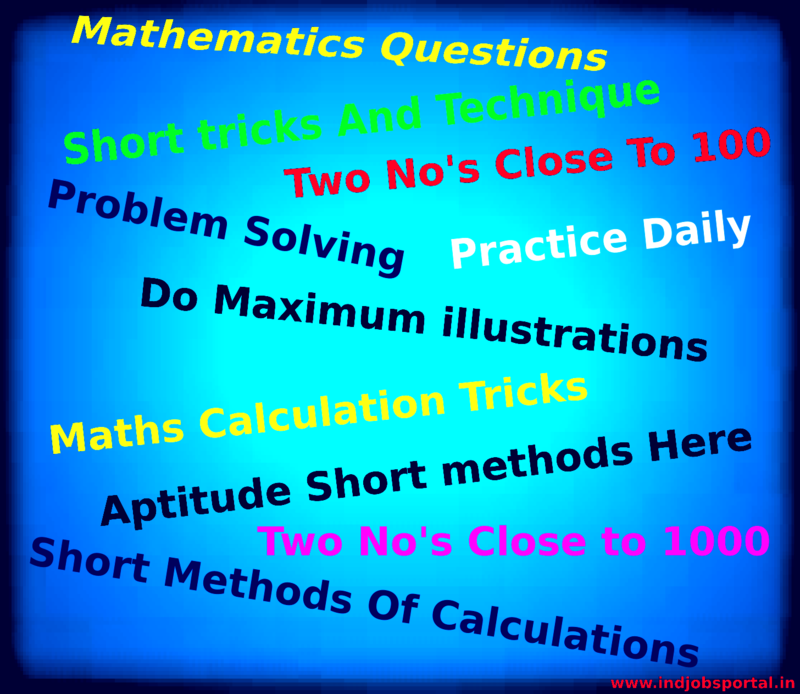 For Some Competitive exams, Governments Recruitments, SSC, IBPS and Other, Quantitative Aptitude is the Determined Part of exams, So You have to need Some Short Trics To solving these questions related to Quantitative Aptitude. 1.0.1 Question 1 : Find The Multiplication Of two Numbers? 1.0.3 Question 2 : Find The Square Of A Number? 1.0.5 Question 3 : Find The Product Of Three digit numbers? 1.0.7 Question 4: Calculate The Multiplication Of Two Digit Numbers? 1.0.9 Question5: Find The Product of Two numbers? Question 1 : Find The Multiplication Of two Numbers? 108 × 104 = ? 108 and 104 are two numbers which is close to 100. Question 2 : Find The Square Of A Number? The Number 112 is close to 100 so…. Step 1: Add the number 112 and 12. Step 2: calculate the product of 12 and 12 and write the query above number. Step 3: Add The Query and this is your Final Answer. Note: Query Will Be Added to 124 so it will become 125. Question 3 : Find The Product Of Three digit numbers? 999 × 992 = ? 999 and 992 are close to 1000 so…. 999 – 8 = 991. -1 × -8 = 8. Becaue the above no’s are close to 1000 therefore 8 can be written as 008. Question 4: Calculate The Multiplication Of Two Digit Numbers? 98 × 104 = ? 98 and 104 are two numbers which is close to 100, And 98 is 2 less than 100 while 104 is 4 more than 100. Question5: Find The Product of Two numbers? 59 × 51 = ? In Above Number write the next digit of number above it. 42 × 48 = ? 63 × 67 = ? A number is divisible by 2, if its unit’s digit is any of 0, 2, 4, 6, 8. A number is divisible by 3, if the sum of its digits is divisible by 3. A number is divisible by 4, if the number formed by the last two digits is divisible by 4. A number is divisible by 5, if its unit’s digit is either 0 or 5. A number is divisible by 6, if it is divisible by both 2 and 3. A number is divisible by 8, if the number formed by the last three digits of the given number is divisible by 8. A number is divisible by 9, if the sum of its digits is divisible by 9. A number is divisible by 10, if it ends with 0. A number is divisible by 11, if the difference of the sum of its digits at odd places and the sum of its digits at even places, is either 0 or a number divisible by 11. A number is divisible by 12, if it is divisible by both 4 and 3. A number is divisible by 14, if it is divisible by 2 as well as 7. Two numbers are said to be co-primes if their H.C.F. is 1. To find if a number, say y is divisible by x, find m and n such that m * n = x and m and n are co-prime numbers. If y is divisible by both m and n then it is divisible by x. Given a number x, you will be asked to find the largest n digit number divisible by x. You will be given with a set of numbers (n1, n2, n3…) and asked to find how many of those numbers are divisible by a specified number x. Given a number series, find the sum of n terms, find nth term etc. Find product of two numbers when their sum/difference and sum of their squares is given. Find the number when divisibility of its digits with certain numbers is given. Find the smallest n digit number divisible by x. Which of the given numbers are prime numbers. Number x when divided by y gives remainder r, what will be the remainder when x2 is divided by y. Given relationship between the digits of number, find the number. Find result of operations (additions, subtractions, multiplications, divisions etc) on given integers. These integers can be large and the question may look difficult and time consuming. But mostly the question will map onto one of the known algebraic equations given in this first tab. If you are given a complex calculation to do, just think for a second, there has to be a better way to do it. Because complex calculations are not tested in an aptitude test, your smartness is. Below is an example for more clarity. Question: 3812 + 5972 = ? Now, to arrive at your answer, you can either manually calculate the squares or you can think in a smarter way. Square of 381 will definitely have the last digit of 1. (11)2; is 121, (21)2 is 441, (31)2 is 961, and so on. So, 3812 would be something like this xxxxx1. Similarly, (597)2 would be something like this, xxxxx9. Without calculating the full number, we just focus on the unit digit. 72 is 49, and the last digit is 9, so 5972 has to end with 9. Now that you have 2 numbers, xxxxx1 and xxxxx9, just add them like an old-fashioned addition question. This way, you know the answer will end with 0, and now look at the options, your answer is D. Quantitative aptitude questions are a cakewalk if you’re equipped with skills like these. Get yourself a mathematics home tuition to develop your skills while you still have time. If you want to calculate 10% of something, you would cut the zero at the end, or put a decimal. This much is known by most people and they don’t do (Number x 10/100). rules to solve these things quickly. 25% is nothing but 1/4th of a number. 75% would be 3/4th of a number. Just calculate 3/4th of your given number and you will arrive at 75%. Now, calculate 1% by either cutting 2 zeroes from the end of your number, or by putting a decimal before 2 places at the end. Once you have that 1%, add it to the 75% which you got earlier. There you go, instead of doing (number x 76/100) and wasting precious time, you are now solving another question.